Chairman Kim Hyun-Jung (4th from left) of the Hyungang Business Group, and his wife Mrs. Ahn Bok-Ju (3rd from left) pose for camera while they were greeting the guests at the opening ceremony of Marina Del Rey yacht restaurant and lounge at Jamshil area of Han River on Dec. 11, 2008. 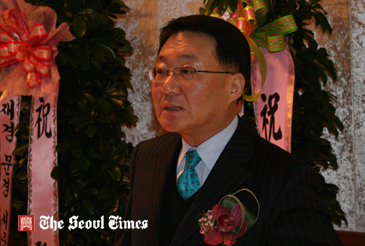 Second from left is Marina Del Rey President Lee Jeong-Shik and to his right is his wife Mrs. Kim Soon-A. At far right is Chairman Oh Kyung-Ho of Chung Cheong University's Board of Trustees . Chairman Kim Hyun-Jung of the Hyungang Business Group, and his wife Mrs. Ahn Bok-Ju hosted the grand opening of his new "Marina Del Rey" yacht restaurant in the Jamshil area on the Han River. The event took place on Dec. 11, 2008, and more than 1,000 well-wishers and high-profile guests were invited to the luxury facility. 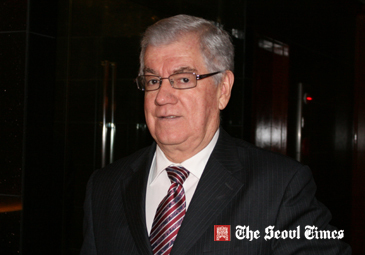 Among the guests at the grand opening ceremony and dinner were scores of top foreign envoys serving here in Seoul. 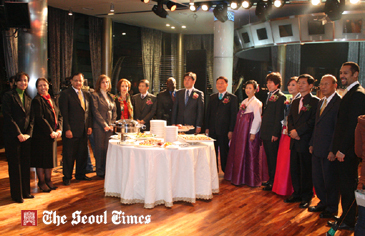 Foreign ambassadors and wives pose for camera with Chairman Kim Hyun-Jung (7th from right) of Hyungang Group, and other VIP guests at the grand opening of Marina Del Rey yacht restaurant at Jamshil area of Han River on Dec. 11, 2008. They included Algerian Amb. Rabah Hadid and his wife Mrs. Sarida Hadid, Dominican Republic's Minister Counsellor Ernesto Torres Pereyra, Egyptian Minister Counsellor Ihab Tahoon and his wife Mrs. Hala Tahoon, Ghana's Minister Counsellor C. Mintah-Agyemang, Honduras' Amb. 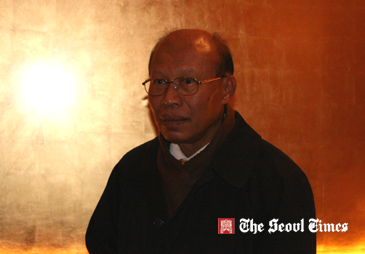 Rene Francisco Umana, Laos Amb. Soukthavone Keola, Mrs. Majida Mostapha, wife of Lebanon Amb. Issam Mostapha, Russia's Counsellor Victor Balashov and his wife Mrs. Lidia Balashov, Serbian Amb. 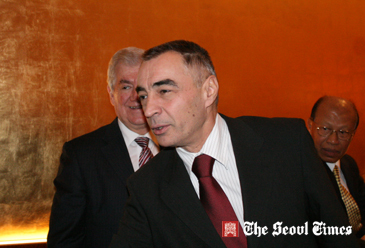 Zoran Veljic, and Sri Lankan Amb. Asitha Perera and his wife Mrs. Ishini Perera. Several celebrities from the entertainment industry were also invited and made appearances. 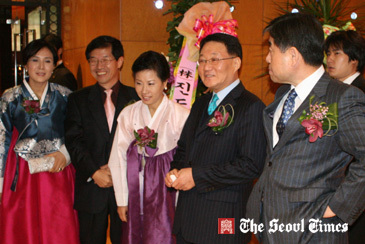 Chairman Kim Hyun-Jung (left) of the Hyungang Business Group is happy with his wife Mrs. Ahn Bok-Ju while greeting guests. Chairman Oh Kyung-Ho of Chung Cheong University's Board of Trustees delivered a welcoming speech. Chairman Oh, better known as Oscar Oh amongst his foreign friends, also serves as chairman of the Korea Yacht Club. 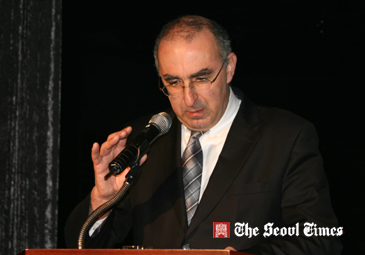 In a congratulatory speech, Algerian Amb. Hadid said that the Marina Del Rey will lead Korea's water "leports" ('leisure' and "sports") culture, the term used to describe interests in sailing, yachts, and any kind of socializing "on the water." The floating restaurant, the newest and largest of its kind on the Han River, is equipped with other state-of-the-art facilities including a wedding hall, coffee shops, bars, a gallery "Prado," as well as a dozen boats. 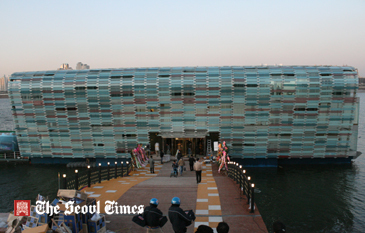 It is located at the Jamshil Marina, Jamshil-dong 1-2 in Songpa-gu. The diplomatic personnel were given access to the second-floor VIP lounge after attending the opening ceremony on the third floor. The evening also included a look around the luxury restaurant on the first floor of the facility. The "Secret Garden" Mediterranean restaurant is open for lunch and dinner. On the second floor is the "El Cid" membership bar, available for weddings and seminars. Ghana's Minister Counsellor C. Mintah-Agyemang (2nd from right) poses with other dignitaries at Marina Del Rey opening. At the "La Fiesta" high-society club, on the third floor, patrons can enjoy live music, wine and masquerade parties. There are approximately 20 boat restaurants on the Han River, but Marina Del Rey is the most luxurious addition to date. Surrounded by the sea on three sides, South Korea offers bright prospects for a yacht culture, and the marine industry in general. Algerian Amb. Rabah Hadid makes a congratulatory speech in front of over 1,000 guests at Marina Del Rey opening. Mrs. Sarida Hadid, wife of Algerian Amb. Rabah Hadid is attending the opening ceremony of Marina Del Rey on Han River's Jamshil. 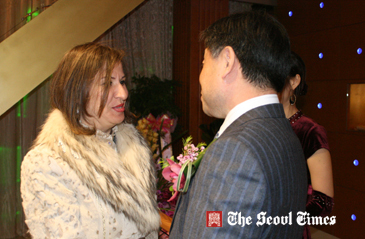 Chairman Oh Kyung-Ho (right) of Chung Cheong University's Board of Trustees greets Mrs. Majida Mostapha, wife of Lebanese Amb. Issam Mostapha at Marina Del Rey in Seoul's Jamshil area. 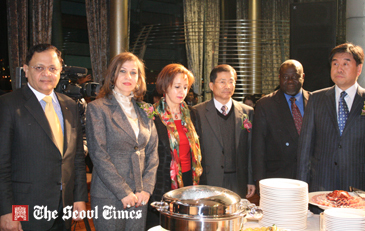 Mrs. Ahn Bok-Ju (center), wife of Chairman Kim Hyun-Jung of the Hyungang Business Group greets Egyptian Minister Counsellor Ihab Tahoon (left) and his wife Mrs. Hala Tahoon at Marina Del Rey yacht restaurant opening in Seoul on Dec. 11, 2008. Mrs. Ahn Bok-Ju (right), wife of Chairman Kim Hyun-Jung of the Hyungang Business Group poses with Mrs. Latifa Khammari, wife of Tunisian Amb. 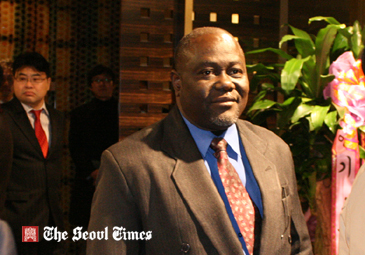 Mustapha Khammari at Marina Del Rey yacht restaurant opening in Seoul on Dec. 11, 2008. Sri Lankan Amb. 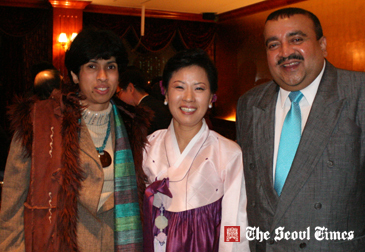 Asitha Perera (right) poses with his wife Mrs. Ishini Perera, and Mrs. Ahn Bok-Ju (center), wife of Chairman Kim Hyun-Jung of the Hyungang Business Group at Marina Del Rey. Mrs. Ahn Bok-Ju (right), wife of Chairman Kim Hyun-Jung of the Hyungang Business Group, greets Dominican Republic's Minister Counsellor Ernesto Torres Pereyra (left) and his friend at Marina Del Rey opening ceremony in Jamshil area of Han River. 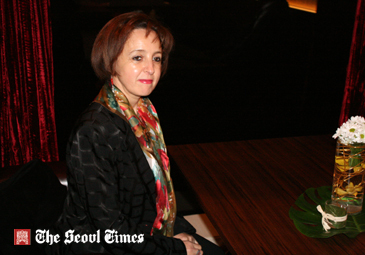 Russia's Counsellor Victor Balashov and his wife Mrs. Lidia Balashov are greeted by Marina Del Rey people in Seoul's Jamshil area on Dec. 11, 2008. Sri Lankan Amb. 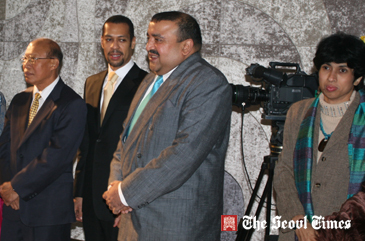 Asitha Perera (2nd from right) and his wife Mrs. Ishini Perera (right) are seen standing with Laos Amb. Soukthavone Keola (left), and Dominican Republic's Minister Counsellor Ernesto Torres Pereyra at Marina Del Rey opening ceremony. 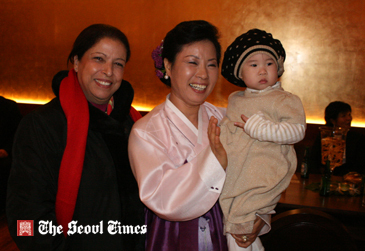 Egyptian Minister Counsellor Ihab Tahoon (left) and his wife Mrs. Hala Tahoon (right) poses with a local singer Oh Ji-Eon at Marina Del Rey yacht restaurant opening in Seoul on Dec. 11, 2008. Ms. Michelle Nam (Nam Yeon-Hee) serves as staff reporter of The Seoul Times. She majored in nutritional science at Sookmyung Women's University in Seoul. She covers the fashion industry and other cultural affairs, as well as the diplomatic community. Her hobbies include playing the piano, reading, and travelling.